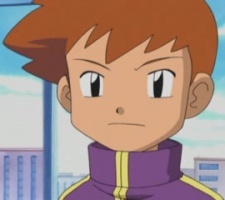 Tommy (Japanese: タクト Takuto) is a student of the Pokémon Trainer's School in Rustboro City. He is voiced by Suzanne Goldish in English and 大谷育江 Ikue Ohtani in Japanese. He is famous for being arrogant and for his impressive knowledge about Pokémon, so when Max was visiting the school in Gonna Rule The School!, Tommy became jealous. He battled Max during a training class the next day in a one-on-one Pokémon battle. Using Magby against Max's Poliwag (though both Pokémon actually belonged to the school), he attempted to defeat Max in order to save face. However, as is usually the case, Team Rocket interrupted in order to make off with all the Pokémon they could. Together, the whole class was able to defeat the villains and send them blasting off again, making Roxanne proud.